The Family is a 501C(3), non-profit, listener-supported organization.All donations are tax-deductible to the full extent of the law. The Family appreciates your financial support as well as your prayers. Credit Cards: Visa, Master Card, Discover and American Express cards are accepted. Credit card donations can be one-time or recur monthly. Please notify us 7 days prior to the withdrawal for any change to be made. Electronic Fund Transfer: Electronic fund transfer is a donation which is transferred directly from your checking or savings account to The Family. EFT’s can be one-time or recur monthly. Recurring EFT’s are usually on the 10th, 15th or 20th of each month. Please notify us 7 days prior to the withdrawal for any change to be made. Stocks, mutual funds, securities or other assets are welcome. Consult your financial advisor for specific information. Charitable Gift Annuities: Charitable Gift Annuities enable you to give and receive! 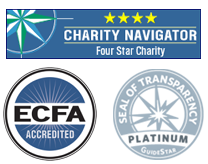 For many 60 and above, one of the best ways to support the ministry, reduce taxes, and earn an excellent rate of return on your money is through the establishment of a charitable gift annuity (CGA). A CGA can be funded with a gift of cash, securities, or practically any other kind of property. In exchange for your gift you receive fixed payments, in addition, there are a number of tax advantages. when CGA is established, donors may deduct the charitable gift portion of the annuity, a part of each check a donor receives is regarded as a tax-free return of principal. Endowment Fund: The Family has an endowment fund that is administered through the Community Foundation for the Fox Valley Region. The fund creates a permanent base for support for the work of The Family. We use the distributions from the endowed funds to help cover operating costs, while the principle remains as a permanent source of income. To learn more, call the Community Foundation of the Fox Valley Region at 920-830-1290. Gifts of Appreciated Assets: Stock certificates can be donated, this unique gift is a blessing and provides the giver with two special tax benefits. First, you are able to deduct the entire fair market value of the stock as a charitable contribution. Secondly, because the stock is donated to the station instead of cashing it out, you are able to avoid payment of any capital gains taxes on the appreciation of the stock and brokerage fees as well. Please consult with your tax advisor on your individual tax portfolio when making charitable donations. Sustaining partner: A sustaining partner is one who gives on an ongoing basis via Electronic Fund Transfer or their Credit/Debit card. This regular monthly support that we can count on is a tremendous help! Every month there are expenses to operate this ministry, such as electric bills for the offices and transmitters, rent, salaries, etc. Your on-going monthly gift will go a long way in helping us cover those regular expenses. Day Sponsorships: A day sponsorship covers the listener’s share of a day of operating expenses. These sponsorships are a HUGE help in providing financial stability to the ministry of The Family. Short messages are produced for each of our day sponsors and are aired approx. once an hour on their selected day/s. People often choose to sponsor a day to honor a special person or event. Matching Funds: Many businesses match donations made by their employees. Check with your Human Resources Department to find out if your pledge may be matched. Business Sponsorships: Being a Business and Ministry Sponsor is easy, fun and effective! Your business or non-profit/church group can become a sponsor during morning or afternoon drive-times or have its name associated with one of our excellent programs. Your sponsorships help support The Family and because our listeners are loyal – it’s great name recognition your business as well. If your non-profit/church group is planning on hosting a special event and you want to get the word out, The Family can help with that, too! For more information on the powerful way to get the WORD out, call your local representative. For a list of business ministry sponsors click here.